Here is my last dispatch from the A/W 2019 Curve Expo. This week, we focus on Panache’s latest offerings. They have lots of pretty things this season, and it was very tough to narrow them down! Here’s the new “Paisley Floral” fashion colorway of my very favorite Panache bra, the Jasmine (28 F-HH, 30-38 D-K), coming in October. Amelie is a new style (28 F-HH, 30-38 D-K) based on the Envy/Jasmine frame. I really like the printed band-solid cup combination. Available in September. The Atlanta is a new style arriving in September (28-38, up to H in all bands). Atlanta features this super cool back that closes with a magnet the neck. 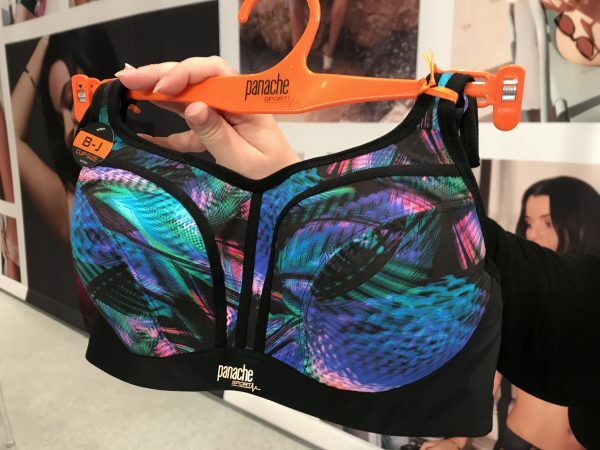 As always, Panache Sport is releasing a bevy of amazing colors. Still no plans for a bikini based on the sports bra, though. The wired one comes in 28 DD-H, 30 D-H, 32 C-J, 34 B-J, 36 B-HH, 38 B-H, 40 D-GG; non-wired comes in 28 DD-H, 30 D-H, 32 C-H, 34-38 B-H, 40 D-GG. “Grey Marl” has been added to the core colors of the wired sports bra, a nice nod to the athleisure trend. It’s being released in September. Love the wired “Graffiti Print,” landing in July. “Graffiti Print” again, to show off the neon blue straps. Wired “Lunar Print,” releasing in September. Coral/orange and army green/olive are one of my favorite color combos. This is the non-wired extended-band in “Coral Multi.” Coming in July. Non-wired standard-band in “White/Black.” The Panache rep pointed out that all the parts of the bra that get dingy (armpits, band, etc.) 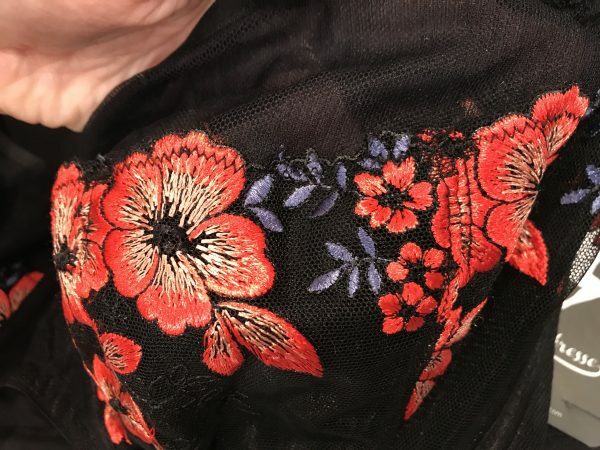 are the black fabric. Available in September. “White/Black” non-wired from the back. Next up in the never-ending Panache coverage is Sculptresse! I think this is the most sophisticated collection Panache has released to date. Seriously, how amazing is this color combo?? The bandeau bikini comes in 30 DD-H, 32-38 D-H and the one-piece in 30 DD-K, 32-40 D-K. Arriving in July.